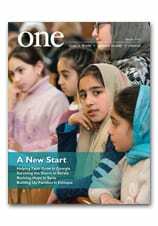 The December 2018 edition of ONE is now online. Christmas arrived early this year: we’ve just posted the December edition of ONE online. Look for it in your mailbox, soon! This edition focuses on those we are calling “The Caregivers” — and within its pages you will find some of the many ways CNEWA works to extend care and compassion to those in need. You will discover how a mobile clinic visits the marginalized Dalits in India, bringing them care and Healing the Forgotten. We’ll take you to A Refuge in Lebanon serving Syrian refugees. And you will see how compassionate caregivers in Ukraine offer the elderly Windows to the World. To experience the powerful photography and award-winning journalism of ONE, read more of our digital magazine at this link. And check out Msgr. John E. Kozar’s video preview of the latest edition below.